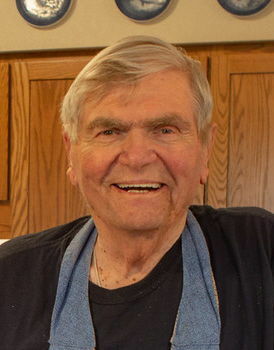 CEDAR FALLS — Jerald E. Jorgensen, 88, of Cedar Falls, died Friday, April 12, at Western Home Communities-Prairie Winds. He was born July 23, 1930, in Harlan, son of Jens and Anne Petersen Jorgensen. He married Erna Thomsen on Sept. 6, 1952, in Racine, Wis. She died July 24, 2010. He graduated from Harlan High School. He attended Dana College for two years and received his DVM from Iowa State University in 1953. He co-owned and operated Brookside Veterinary Clinic in Cedar Falls with his brothers, Harris and George. Jerry served on the Cedar Falls City Council, Cedar Falls School Board, Nazareth Lutheran Church Council and was a member of the Cedar Falls Rotary. Survived by: two daughters, Laurie (Brent) Wightman of Waverly and Lisa (Martin) Schwab of Broomfield, Colo.; two sons, Jeff (Jacque) of Cedar Falls and Tom (Karen) of West Des Moines; nine grandchildren, Matt and Emily Wightman, Ben (Kelsey), Zach and Tim Jorgensen, Ellie and Danny Jorgensen, Conner and Olivia Schwab; a great-grandchild, Max Jorgensen; four stepgrandchildren, Stephanie (Adam) Geneser, Stacey (Brandon) Hall, Dr. Samantha (Travis) Schipull and Sabrina (Colton) Vosberg; nine stepgreat-grandchildren, Jacob, Brooklyn and Stella Geneser, Hudson and Hayes Hall, Noah and Landon Schipull, Mason and Ruby Vosberg; three brothers, Jim, Harris and George (Judy) Jorgensen, all of Cedar Falls; and a sister, Joan (Jim) Hoeft of Castle Rock, Colo.
Services: 10:30 a.m. Friday, April 19, at the Diamond Event Center-Western Home Communities. Visitation will be from 5 to 8 p.m. Thursday, April 18, at Richardson Funeral Service and also for one hour before services at the Western Home. Memorials: may be directed to Cedar Valley Hospice or Fresh Wind Ministries at Western Home Communities. Beloved father and grandfather. He was an avid ISU Cyclones and STL Cardinals fan. He was a devoted caregiver to mom in her battle with Alzheimer’s. He loved his children and adored his grandchildren. Last but not least, he will be fondly remembered for his cinnamon rolls.